NEW DELHI: A day after BJP president Amit Shah asked Rahul Gandhi to “check facts”, Congress president on Saturday offered proof of his allegations where he had accused the BJP of “fuelling” violence against the Dalits and the Adivasis. 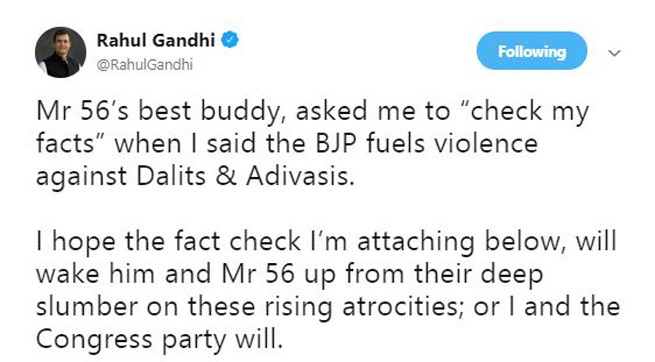 In a tweet, Rahul, addressing the Prime Minister as Mr 56, attached a news report claiming that BJP-ruled states have the highest number of cases of atrocities against the dalit community. “Mr 56’s best buddy, asked me to “check my facts” when I said the BJP fuels violence against Dalits & Adivasis. I hope the fact check I’m attaching below, will wake him and Mr 56 up from their deep slumber on these rising atrocities; or I and the Congress party will,” he said. On Friday, BJP president Amit Shah, responding to the Congress chief’s accusations, had asked the latter to look at facts when “free from winking” and alleged it was the opposition party that had a legacy of insulting Dalits. In a series of tweets, Shah said the Prime Minister’s legacy includes “strongest amendments to SC/ST Act” and setting up of the OBC Commission, while the Congress legacy was about insulting Dalit leaders, opposing the Mandal Commission report and blocking a move to empower the OBC body. His attack at the Congress and its president came after Gandhi joined a protest at Jantar Mantar and criticised Modi over his government’s policies towards Dalits. In a series of tweets scoffing at Gandhi, Shah asked him to spend some time on facts “when you are free from winking and disrupting Parliament” and asserted that the NDA government has ensured the strongest amendment to the Scheduled Castes and Scheduled Tribes (Prevention of Atrocities) Act. He was referring to Gandhi’s apparent wink in Lok Sabha after hugging Modi during a debate on the no-confidence motion against the government. “Why are you protesting that?”, Shah asked Gandhi while talking about the new bill that seeks to reverse a recent Supreme Court order that put additional safeguards against the arrest of accused in cases of atrocities against Dalits. Earlier in the day, Gandhi had said the Congress government had brought the atrocities act and his party will protect it together with everybody. Alleging that Dalits are being openly beaten and crushed in states where the BJP is in power, Gandhi said the prime minister’s “thinking is anti-Dalit”. “All Dalits and people from the weaker sections know that the prime minister has no place for Dalits in his heart and mind and wants to crush Dalits. That is why we are standing against him,” he had said. Attacking Gandhi, Shah said it would have been good if the Congress leader had spoken about his party’s treatment of Bhim Rao Ambedkar, Babu Jagjivan Ram and Sitaram Kesari. “Congress way of treating Dalits is patronising and condescending. For years Congress insulted Dalit aspirations,” Shah said. He asked whether it was a coincidence that the year Sonia Gandhi joined the Congress, the third front-Congress government opposed reservations in promotions and the year Rahul Gandhi became the party president, it opposed a tough SC/ SCT Act and the OBC Commission. “Anti-backward mindset visible,” Shah tweeted. “Mr Rahul Gandhi, expecting research and honesty is difficult from you but do read Mr Rajiv Gandhi’s speech during Mandal (row), when he opposed it (its recommendations) tooth & nail. The sense of entitlement and hatred for backward communities comes out so clearly. And today you talk about Dalit welfare!” he said. Shah further said the Modi government has developed a ‘panchteerth’ — a reference to five places associated with the life of Ambedkar, while the Congress insulted Dalit leaders and pride.